A massive computer nerd, Franklin is a video game junkie and has degree in Computer Science and a Computer Information Science minor. Franklin was very excited to be trained as a projectionist, in the advent of a digital projection system being installed at the Multiplex 10. He plays a lot of MMOs and supplements his income by goldfarming in World of Warcraft and mining in EVE Online, as well as developing mobile apps. 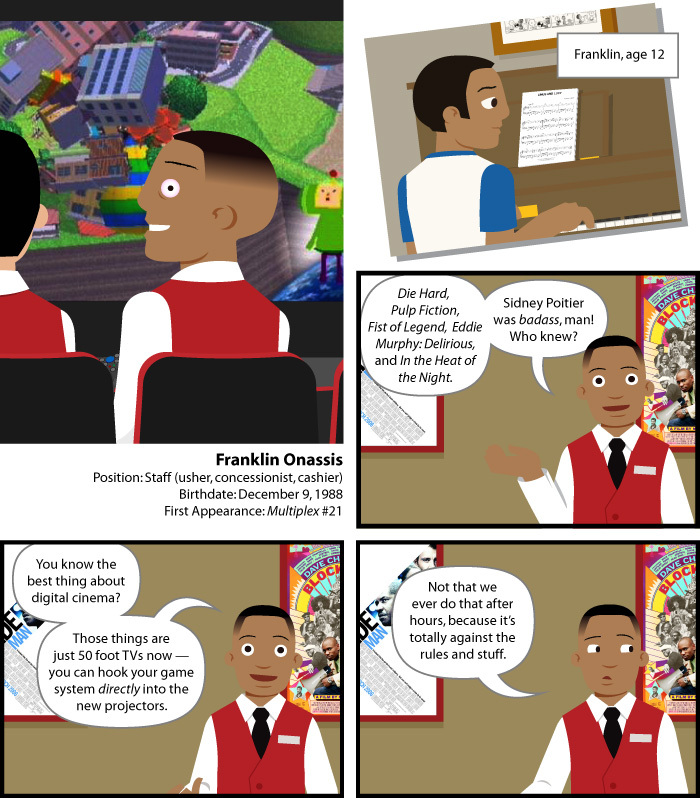 In 2008, Franklin organized video game matches between the Multiplex staff and the Flickhead Video staff, but after Gretchen published a story about their Football 09 tournament against Flickhead Video, Franklin was fired and told that the Multiplex 10 was withholding his final paycheck because they viewed his improper use of the digital projects as “theft” (because the ordinarily Multiplex 10 rents out theaters for video gameplay). But Allen was lying, and in fact simply wanted to illegally withhold Franklin’s last paycheck so that he could pocket it himself. Neil, however, sicced the local projectionist’s union on him and managed to secure Franklin his last check after all. Neil also uncovered that Allen had filed a different termination form with corporate, which stated that Franklin was dismissed for insubordination, not theft, so that they wouldn’t scrutinize Franklin’s termination. Neil used this to his advantage by requesting a copy of the more benign form and replacing the copy in the Multiplex 10’s files. Because no one at corporate was aware that Franklin was supposedly fired for theft, he was considered eligible for rehire — so once Allen was let go, Franklin was safe to come back home to the Multiplex. Although Franklin is usually quite the ladies’ man, his attempts to woo Multiplex 10 newcomer Ariela were remarkably futile. Eventually, we learned that she was involved in some capacity with both Whitey and the assistant manager Max, a situation which blew up in her face and prompted her to quit. Becky and Franklin were promoted to Co-Lead Projectionists in April 2010. Becky stepped down in the spring of 2013 when she took a full-time teaching position, leaving Franklin as the Lead Projectionist. Franklin began dating Letizia (“Tease”) secretly in November 2010. After Jason found out about it from Jillian after a little over a year, he eventually came clean to Kurt, Melissa, and Becky, as well.